There comes a time in every photographer’s life when it’s time to upgrade to a new bag. As we accumulate common photography paraphernalia (camera bodies, lenses, speedlights, and the list goes on), it becomes increasingly difficult to fit these toys into smaller bags. This was certainly the case for me. Enter the Ruggard Triumph 45 Sling Bag. This bag was a game changer for me and made me more efficient as a photographer. To say that it was an upgrade from my former, smaller bag is an understatement. Let’s dive into the details of this handy bag. The first thing I noticed was that the material all around the bag was very thick. Personally, I tend to be a bit rough with my equipment, so having a bag that can withstand me slamming it around is, frankly, a relief. (In fact, it’s already withstood a handful a few falls.) There’s even extra padding on the back of the bag to further shield its contents from rough impact. In addition, it comes with a built-in rain cover, which is accessible from a zippered pocket in the upper right-hand corner of the bag. Wildlife and nature photographers will find that feature very handy. Pockets and crevices make me giddy, and this bag certainly has plenty of those. One of my issues with my former smaller bag was that I did not have space to put my “micro essentials,” such as extra batteries, business cards, duct tape, and of course, plenty of gum. However, this bag has plenty of room for those tools, with space left to spare for your actual camera equipment, of course. Honestly, learning how to put on the strap was a bit of a learning curve for me. For most, it’s probably a preferred feature. In my case, I tend to struggle with things most folks find simple, perhaps because I’m left-handed. My natural instinct is to sling it from the opposite side of the body than what is required. Additionally, all throughout grade school, high school, and college, I wore backpacks that had two straps, so I’m hard-wired for two strap packs. This was simply a personal issue. Despite my early struggles, I learned how to properly sling it over my shoulder after a week or so. This bag has become my go-to sidekick for my business portrait assignments. It’s great because about 90% of the equipment I need for a portrait session fits into the bag. In addition, when I go on hikes for nature photography, this bag is durable and fits everything I need, including my water bottle and an extra sweater. 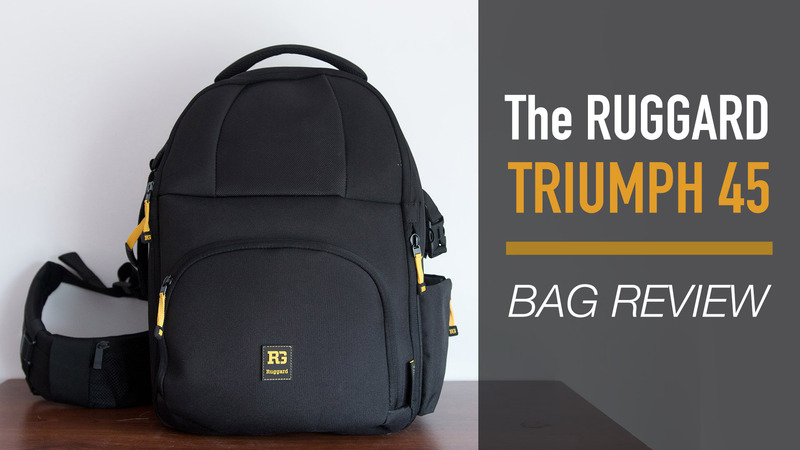 While for more simple assignments I use my smaller bag, I use the Ruggard Triumph most of the time. If you’re looking for an affordable and durable bag for your equipment, consider the Ruggard Triumph 45 Sling Bag. It’s a great piece of gear to add to your repertoire.